No discussion about women’s health is complete without properly addressing the subject of menstruation. Period is a biological fact of life for women. Its impact on her physical and emotional well-being, as well as on her ability to make social and economic contribution, is known to be profound. Yet, matters related to menstrual hygiene management (or MHM) and sanitation remain neglected. In the case of most developing countries, and particularly India, discussions on menstrual hygiene are met with an uncomfortable silence, automatically relegating the issue to the bottom of the list of concerns when it comes to the plotting of national sanitation schemes. Our sanitation programmes promote gender equality through right to access and dignity, but fail to address the notion of gender equity. However, when we speak of Bathroom Justice, we seek to promote women’s right to dignity, hygiene and self-respect, as well as the concept of equity. And menstrual care is all about equity, or the rampant lack of it when it comes to providing adequate social and physical means to look after a woman’s menstrual hygiene. So even though, the sanitation schemes try to ensure gender equality by providing an equal number of bathrooms for men and women, as long as the ladies’ bathrooms remain unequipped with the means to manage menstrual hygiene, we continue to miss out on gender equity. When it comes to menstrual hygiene management, gender inequity amounts to a denial of social justice because it is caused by a failure to meet a woman’s needs as a biological female, thereby putting her at a social and economic disadvantage with respect to her male counterparts. Unfortunately, for most adolescent girls and women in India, this inequity is a monthly reality that they must find ways to deal with. A 2015 report on menstrual hygiene management claims that there are about 113 million adolescent girls who stand vulnerable, owing to the lack of reservations made for them to tackle the onset of menarche. Out of the 14,724 government schools, only 53 % had a separate and usable girls’ toilet. When it came to private washrooms, as of 2015, about 132 million households lack a toilet, requiring women and girls to use the public toilets or forcing them to defecate in the open. Public toilets can be far away, and this makes menstruation even more of a challenge than what it already is. The obvious huddles in the path of Indian women and their health are poverty and a lack of economic independence. Several barriers – primarily financial – lead to a lack of access to essential menstrual supplies that a woman needs during her period. As per a 2014 report by Dasra, Kiawah Trust and USAID, almost 88% of women and girls in India resort to using rags, ashes, leaves, scrap material, or nothing at all. But these crude measures not only expose women to a variety of vaginal infections and other diseases, but also lead to humiliation, discomfort, and lack of social mobility. For those five to seven days every month, the girls withdraw from social life. 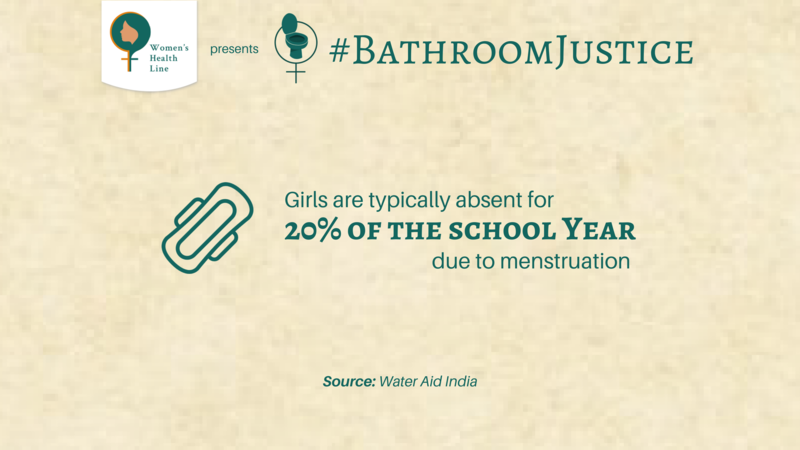 Far too many girls start missing classes, or simply drop out of school in the face of a lack of proper toilets in schools. The consequences of this social withdrawal are devastating and unacceptable, as the girls begin to lose on grades, fail to graduate, are forced to dropout, marry early, and have children, when they could have completed their education and secured employment. Instead, they miss out on crucial opportunities to grow and develop as a human being. Many women working in informal workplaces, such as markets or construction sites, face greater challenges in managing menstruation at work as they are often required to use public toilets that they also share with men. Adding to the woes, these toilets sometimes require a user fee, are locked, dirty, or lack water supply, or a safe and discreet disposal system. In 2015, the Ministry of Drinking Water and Sanitation had issued guidelines on Menstrual Hygiene Management, as part of Swachh Bharat Mission (SBM). These guidelines were issued in the form of advisory to the states, and it was mandated that public toilets should be designed to ensure safe and private entrance to women’s toilets, with proper lighting after evening hours. Besides, toilet cubicles should be provided with a shelf, hooks or niche to keep clothing and menstrual absorbents dry. The advisory also says that disposal bins with lids should be placed within the toilet and incinerators should be built to avoid transport on menstrual waste. The stress laid on menstrual health of the women, as well as that of the sanitation workers who clean the menstrual waste, in these guidelines is laudable; however, the conspicuous lack of many of these hardware facilities in the construction of public toilets exposes the gap in SBM’s policy and implementation. Wherever it seems that efforts were made to put in place hooks, shelves, and dustbins as per the specifications, it is dismaying that poor maintenance and a failure in raising awareness regarding the use of these facilities have rendered these as no longer usable. To make up for the lack in our sanitation facilities, it is imperative that toilets are designed and built to be women-friendly, that is, toilets must have the additional space required for washing reusable menstrual management products. Consultation with women and girls during the design phase would help to ensure that their menstrual management needs are properly addressed. Another need is for better information through the right channels to help women and girls select safe materials for menstrual management and appropriate disposal methods. It has been observed that owing to the taboos surrounding menstrual blood, girls and women are left with no choice but to hide the washed rags as having them dry in the sun can cause embarrassment. However, sunlight being essential for sterilization of the cloth, not leaving these rags out to dry causes insects and microbes to settle on them causing infections on reuse. The same problem could occur with reusable menstrual pads. Thus, there is a need to identify options that do not pose such risks, and make them available to women and girls. Additionally, greater community involvement is required by educating and disseminating reliable information to not just teenage girls and women, but also men and boys, so that some part of the social taboo can be done away with. After all, menstrual hygiene management is not merely a women’s health issue - and should not be dismissed as such - as it affects the society at large. Menstrual hygiene management should be openly discussed in terms of how it is related to gender discrimination, health risks, and a cause for potential economic concern, so that women no longer have to bleed in hiding.